Great Grandma (Apo) and her brother and sisters. Click on the picture to read an entry about her family (Chings) in Waipahu. 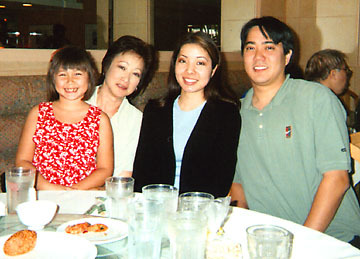 Click on his name below to see pictures of Apos older sisters (on the far right in the picture above) son Hung Chee Tom, with whom we have recently gotten in touch because his wife Peggy just happened to become friends of Sonny and Muriel Ho when she worked in New York in the 1960s. Just another one of those strange coincidences which proves how small the world can be. Embarrassing moments: forced to do the hula. Click on the photo to enlarge. 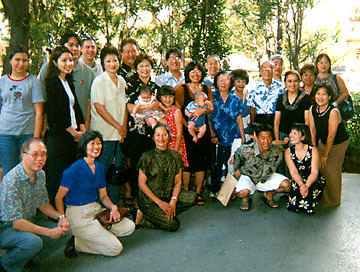 Group portrait at the Au clans 2005 Chinese New Year luncheon. It took place at Tonys Cuisine, which sounds more like an Italian-French than the Chinese restaurant that it is. Cerrisa, Kaila, baby Kami, Cathy and Kevin. Kaila, Pat, Marissa and Lance. Group portrait at the Pagoda during a family get-together at Chinese New Year, 2000. Aunty Marys 80th birthday party, November 1989. Grandpa, Aunty Carol, Grandma and Uncle George. Dads cousins Pat (Uncle Georges daughter) and Ann (cousin John Ishikawas wife). 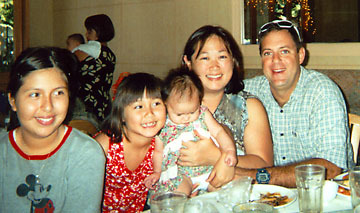 This is about a month after we discovered that their daughters Jacie and Raimi were related through Grandma and Grandpa. See the Sakamoto > Ishikawa section for more pictures taken during this party at John and Anns home. Jacie and Raimi at graduation. Merle, David, Jacie and Uncle George at graduation. Picnic at Kakaako Beach Park, Grandpas old neighborhood, July 2000. Yvonne, Aunty Carol, Aileen, Stan, Willa, Lynette, Mom and me. Aunty Pats family: Lance, Pat, Jacie and Mike Hamai. Uncle Georges family at the Chinese New Year get-together 2001. Photo from Aunty Pat Hamai. Chinese New Year get-together at Aloha Tower Market Place, 2003. 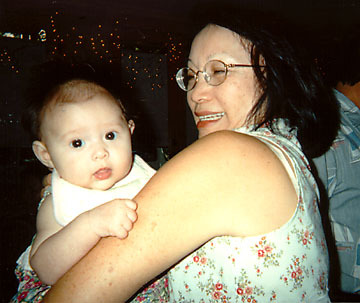 Chinese New Year 2003. Photo of just the ladies.